Simplilearn’s AWS Developer Associate training is designed to enhance your proficiency with the Amazon Web Services (AWS) cloud platform to develop and deploy robust cloud applications. This course builds upon the skills learned from the AWS Technical Essentials course and will show you how to write code and design scalable applications, implement application security and testing, and develop expertise with key AWS components such as S3, Dynamo DB, Elastic Beanstalk, CloudFormation and more. The AWS Developer Associate training picks up where the AWS Technical Essentials course left off, showing you how to plan, design and deploy scalable cloud solutions using Amazon Web Services (AWS). You will learn to work with the key AWS components such as S3, EC2, IAM, DB services, DynamoDB, AWS application services, cost management, Lambda and Kinesis management tools, VPC, Route 53, SDK, CLI and AWS security features. The course is designed to improve your mastery working with AWS and to help you pass the AWS Developer Associate Exam on the first attempt. 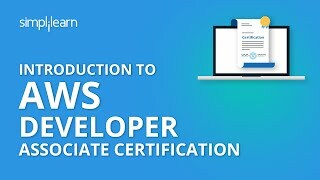 The AWS Certified Developer Associate Level exam is designed for developers who have one or more years of experience coding solutions using AWS for Amazon Simple Storage Service, Amazon DynamoDB, Amazon Simple Queue Service, Amazon Simple Notification Service, Amazon Simple Workflow Service, AWS Elastic Beanstalk and AWS CloudFormation. It has been a power packed session, couldn't expect more!! Thanks to Narendra for his energy and insight he brings to the class.When I started the course, I had zero knowledge about AWS, but after the sessions, I feel to have empowered myself with the cutting edge technology and the confidence to handle projects for my organization. A well-oriented session and credit goes to Narendra for such an awesome training, he has put life in the PPts with the practical sessions!! His vision to tackle and keep different candidates from different backgrounds is really commendable. Kudos to Narendra!! Kudos to the trainer as she explained everything well in detail and answered questions with live demos. I give 100 Marks to the trainer. I have completed the AWS developer associate certification from Simplilearn. The course content was very elaborate. Simplilearn helped me view the training and learning in an entirely new way. It was great to be a part of the training program. The online webinar and trainers were excellent. I am planning to enroll for the Master expert program. The customer support was excellent through LMS. LMS portal is just awesome. Forum helps to resolve queries and connect with people. The session was very interactive and useful. AWS Developer Associate Certification from Simplilearn was simply amazing. We got ample lab to exercise after each topic. This really helped me to understand the concept. All of our highly qualified trainers are AWS certified, with more than 15 years of experience in training and working in their domain. Each of them has gone through a rigorous selection process, which includes profile screening, technical evaluation and a training demo before they qualify as Simplilearn trainers. We also ensure that only those trainers who maintain a high alumni rating continue to train for us. What is the question format of AWS Certified Developer Associate exam? The AWS Certified Developer Associate exam is a combination of multiple-choice and multiple-answer questions. The courses are conducted via live virtual classrooms (LVC). They are interactive sessions that enable you to ask questions and participate in discussions during class time. We do, however, provide recordings of each session you attend for your future reference. Classes are attended by a global audience to enrich your learning experience.